Hopewell Theater is celebrating their one-year reopening with a concert featuring Paul Muldoon and the group Rogue Oliphant on September 8 at 8 p.m. ~Courtesy of New Jersey Business & Industry Association, Bridgewater Courier News. HOPEWELL – The landmark 180-seat Hopewell Theater re-opened in September 2017 after an extensive renovation. 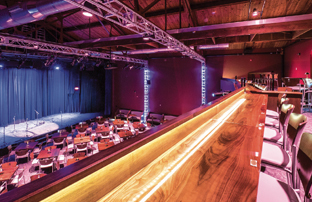 The theater owners’ goal was to transform the site into the region’s most intimate dine-in arts venue, with selectively eclectic live music, films, talks, and gourmet pop-up supper clubs. To mark its one-year anniversary, Hopewell Theater will host a concert featuring Irish Pulitzer Prize-winning poet Paul Muldoon and Rogue Oliphant, at 8 p.m. Saturday, Sept. 8. Their presentation of songs and spoken-word pieces will be supported by musicians from several indie bands well-know in their own right: Cait O’Riordan (The Pogues), Warren Zanes (The Del Fuegos), Sim Cain (Rollins Band), David Mansfield (Bob Dylan’s Rolling Thunder Review, The Alpha Band), and Chris Harford (The Band of Changes).